It was a privilege to give out High Street vouchers to some of the photography and art competition winners. Stacey Turner won the adult category photography competition, with Grace Martin winning the under-11 category in both the photography and art competitions. Her Mum, Gemma, came 3rd in the photography competition and 2nd in the art competition, whilst Ann Shirley Swales came 2nd in the photography competition and 3rd in the art competition. 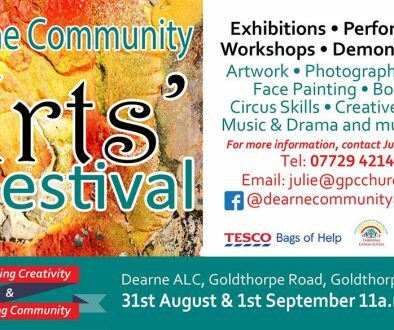 The overall adult art winner was Pam Iles and the winners in the 12-18 category (1st prize photography: Connor Brown/ 1st prize art Hermione Law, 2nd prize art Jack Leyton and 3rd prize art Charlotte Tonge) will receive their prizes at an assembly at Dearne ALC in the near future. 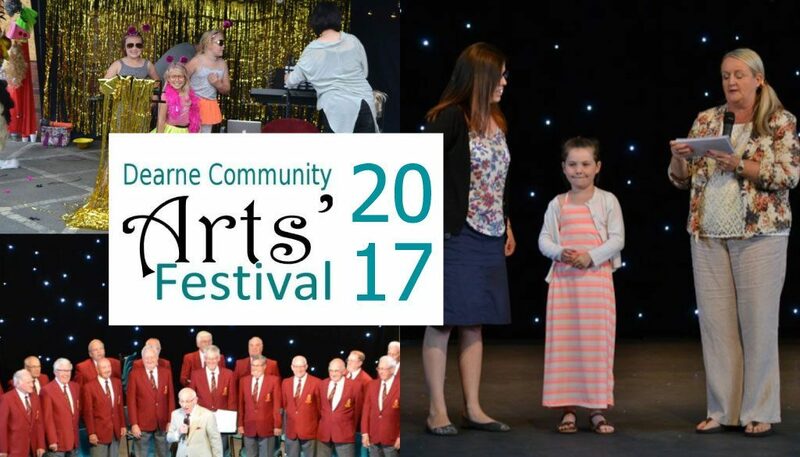 There were lots of different performances on stage over the two days, as well as the awards’ ceremony for our competition winners on the Saturday with prizes given out by April Fisher the Support Worker for Goldthorpe and Bolton on Dearne Big Local (Prizes were supplied by Big Local). There was music from Pat & Andy Moore and The Grumpy Old Men; a fashion show from our local sewing class and the Thurnscoe Harmonic Male Voice Choir a Lindyhop demonstation/tuition which got everyone’s feet tapping and a wonderful performance by the Clayton Dance School and Jaimee Athorne. 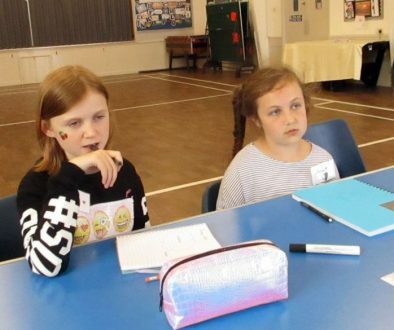 A huge thank you to Ian McMillan for coming along and hosting the creative writing workshop. Great fun was had writing weird and wonderful poems and it was amazing how much inspiration this man could draw from a backstage changing room at the Dearne Playhouse! 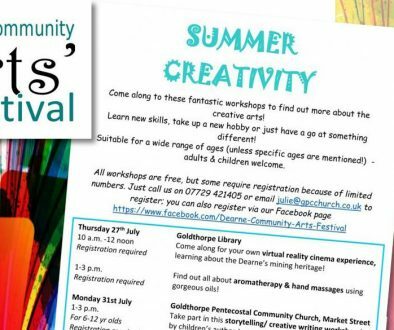 The organisers were especially grateful to Big Local (Goldthorpe & Bolton-on-Dearne) for funding for publicity materials, banners and programmes for the festival and the High Street Vouchers for the competition prizes. The amount of art exhibited by local people was quite dazzling and really showcased the amazing creativity in our local community. Thurnscoe Harmonic Male Voice Choir gave us a fantastic concert lasting an hour, with a wide range of songs. They made the hairs on the back of our necks stand up. ‘Glory, glory, hallelujah, the truth is marching on!’ We are so grateful for the choir, which now rehearses twice a week in Goldthorpe, for giving us this free concert ‘on home ground’, as they said! Here's a video from the Thurnscoe Harmonic Male Voice Choir's concert yesterday. It was such a privilege to have them sing at the festival. Thanks also to Irene Hill, their accompanist for over 60 years!